The wife of a soldier who was shot dead while home for the holidays is accused of concocting a plot with her lover to murder her husband. Sgt Tyrone Hassel III, 23, was home in Michigan for the holidays when he was ambushed and killed just before midnight on New Years Eve while bringing food to his wife from a family gathering. 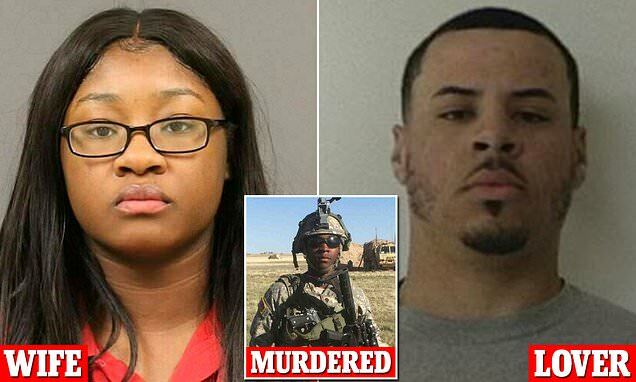 Police say another soldier Jeremy Cuellar, 24, pulled the trigger in a plan that involved Tyrone's wife Spc Kemia Hassel, 22, who is also the mother of Tyrone's one-year-old child. Both Kemia and Cuellar are active duty soldiers at Fort Stewart in Georgia along with Tyrone. Prosecutors have charged both Cuellar and Kemia with premeditated murder. 'It was planned out. Basically my son was assassinated,' his father Tyrone Hassel Jr said. Cuellar is in custody in Liberty County, Georgia, and will be extradited to Michigan. Hassel's father said he's stunned by the allegations and was deceived by his daughter-in-law.